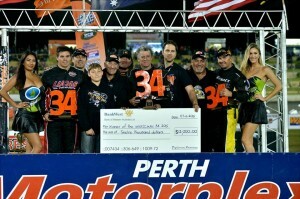 Lance lands Magic Man 34 in Perth | Talking Speedway, Speedway news from around the world! 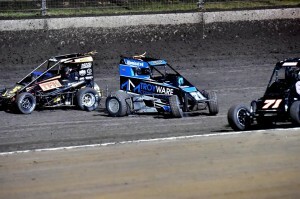 Neville Lance the 2013 Australian Speedcar Champion fought through cautions, crashes and final pressure from US POWRi star Austin Brown to take the ninth Magic Man 34 Title at the Perth Motorplex. 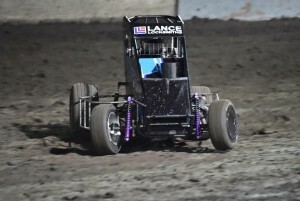 Lance a veteran of Western Australian Speedcars reminded fans that there is still life left in the old locksmith .The race promised so much after qualifying, heats and the pole shuffle. The build up to the 34 lap Feature saw some inspired racing topped off by the pole shuffle win by Darren Hagen over Queensland Troy Ware. Adrenalin, enthusiasm at the start of any Championship race is part of the excitement and can generally lead to pile ups and damage to cars and driver‘s title aspirations .Such was the case for Ware and Hagen as they raced into the 3rd corner , lap one when Ware, the leading points scorer spun causing the early pile up and caution .The restart was called back and a third start finally had the field racing for Magic Man glory .Lee Redmond lead the restart with Hagen out and Ware forced back of field. Redmond continued to lead with Tyler Thomas, Austin Brown and Davey Ray on the charge .Lap 7 and Thomas’s pressure finally opened the gap for the race lead. For the next two laps Thomas exercise his authority over the field before suffering tire problems that had the American into the wall in turn one , nine laps in and once again Thomas is benched and an Aussie win goes begging , again for the likable young American. Moving slowly forward from his 13th starting position Neville Lance was now challenging lee Redmond for the race lead and by lap 11 had the #14 racecar in the lead. Behind Lance and Redmond the Americans were looking dangerous; they were coming .Davey Ray ahead of Brown while Kingshott and Smee were involved in their titanic battle. Lap 18 was as far as Davey Ray’s race lasted forcing the 4 times winner infield and allowing Brown to start to chase down Redmond for second and to close down the lead Lance had built .The interest of the crowd was clear, could Lance withstand this late storming finish by Brown. The charge to the finish was on, the crowd very clearly behind Lance .Last corner, last charge by Brown but the old master was not having any of it and closed out the American to cross the stripe as the ninth winner of the Magic Man 34 event. Lance a worthy Champion who in the past had race against the Magic Man but this was the first time that the Locksmith had made a Magic man podium .Redmond followed a close third with Kingshott holding off Smee for fifth . Magic Man 34 result: 1st Neville Lance, 2nd Austin Brown, 3rd Lee Redmond, 4th Dayne Kingshott, 5th Nathan Smee, 6th Todd Waddell, 7th Kaiden Manders, 8th Ben Hall, 9th Glen Mears, 10th Scott Glazebrook, 11th Alex Bright, 12th Phil Tremeer, 13th Domain Ramsay, 14th Jason Bell, 15th Graham Knuckey. DNF: Davey Ray, Tyler Thomas, Troy Ware, Paul Farrell, Darren Hagen, Ryan Condren, Todd Bennett. DNS: Grant Draney and Chris Griffiths. The five touring Americans and all the top Australian drivers will back in action at the remaining four rounds .Darren Hagen, Tyler Thomas and Austin Brown look to be the biggest threat to another Australian victory. The Pro Speedcar Week team headed by Brett Thomas and Lee Redmond has put together a quality series that has brought 5 top class Americans to challenge many of Australia’s best over a short and sharp weeks racing. This entry was posted in Australian Speedcar Championship by admin. Bookmark the permalink.